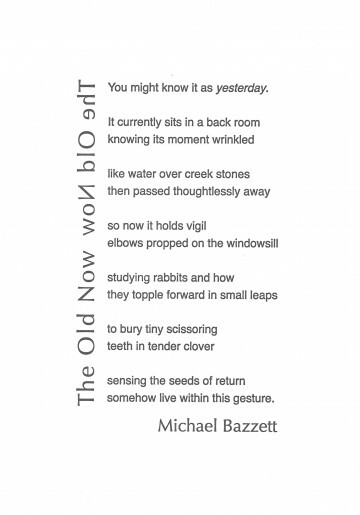 Michael Bazzett’s poems have appeared in West Branch, Beloit Poetry Journal, Best New Poets, Green Mountains Review, DIAGRAM, and Guernica, among others, and his work was recently nominated for a Pushcart Prize. He was the winner of the 2008 Bechtel Prize from Teachers & Writers Collaborative, and new poems are forthcoming in Carolina Quarterly, Pleiades, Smartish Pace and The Literary Review. He lives in Minneapolis with his wife and two children.